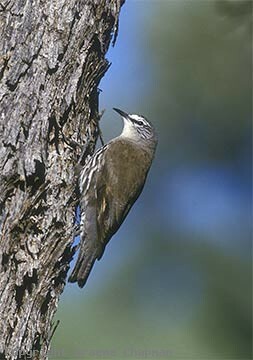 White-browed Treecreepers are birds of the inland - in particular they prefer she-oak woodlands (Casuarina) but they are also widespread in mulga scrub and very occasionally in native pine (Callitris). 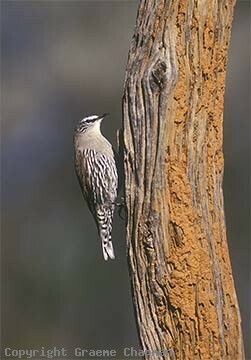 Their closest relative is the Red-browed Treecreeper, a seemingly unlikely alliance because their life histories are quite different. 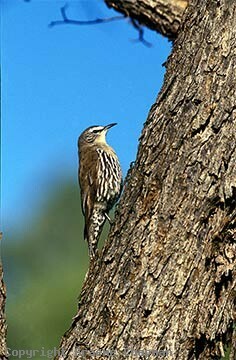 Rather than communal, White-browed Treecreepers are rather solitary individuals. They occur in pairs in quite large territories and usually forage alone, but always within hearing of one another. 561201 ... White-browed Treecreeper male. 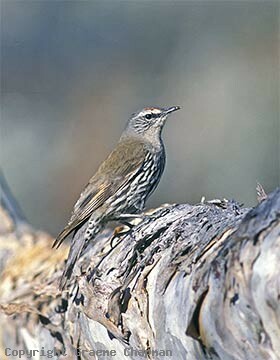 561204 ... White-browed Treecreeper, female showing red eyebrow.